Jim Nathan, CEO of Fort Myers, Fla.-based Lee Health, retired last week after nearly 35 years at the helm of the health system. Lee Health grew from a single, struggling downtown hospital to a dominant regional player in southwest Florida during Nathan's tenure. He has agreed to stay on as an advisor to the board of directors. 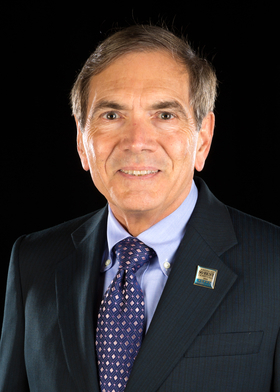 Nathan's successor, Dr. Larry Antonucci had been Nathan's second-in-command as the system's chief operating officer. Lee Health is a public hospital system with an elected board of directors, but receives no taxpayer funding, Nathan said in an interview last week. From humble roots as a downtown hospital with a predominantly Medicare and Medicaid payer mix, Nathan used acquisitions, organic growth and creative borrowing tactics to build Lee into a four-hospital system with annual revenue in 2016 of $1.6 billion. The four hospitals are the downtown flagship Lee Memorial, HealthPark Medical Center in Fort Myers, Gulf Coast Medical Center in Fort Myers and Cape Coral Hospital. It also owns a rehabilitation hospital and Golisano Children's Hospital of Southwest Florida. The $200 million children's hospital, which opened in May, was financed through $100 million of philantrophy and the other $100 million from system cash. Nathan said Lee Health generates a healthy operating margin of 5% and its commercial payer mix is now about 35% compared to 19% when he took over as CEO in 1982. Except for a three-year consulting gig between 1997 and 2000, Nathan, 70, served as CEO the entire time until his retirement last week. In 2006, Nathan pulled off a rare feat when the little public hospital system bought two hospitals from investor-owned giant HCA and combined them into the one hospital now known as Gulf Coast Medical Center. It was a minnow pinching off a piece of a whale. "Whenever I asked them whether they wanted to sell, I either got 'no' or 'hell no'," Nathan said. Today, Lee Health is undertaking a $350 million expansion and modernization of Gulf Coast Medical Center that will nearly double the number of beds from 349 to 649, Nathan said. The expanded facilities are scheduled to open in 2021, he said. Lee Health is spreading out in a go-go market. The population of Fort Myers and Lee County is growing at a rate of about 3% per year, making it among the fastest-growing metropolitan areas in the country. Antonucci, 63, is an OBGYN who joined Lee Health in 2007 after building and running a multi-specialty physicians group in Fort Myers. Nathan said when he became CEO of Lee Memorial Hospital in 1982, the business had no income or the ability of borrow in the bond market. So he and management hatched a plan to borrow against the assets of the hospital to raise enough money for maintenance and eventual growth. As the operations began generating a surplus, the system used cash for the bulk of its acquisitions and expansion. "We had to figure out how to be creative," Nathan said.